Box has been one of the hottest enterprise tech startups for some time now. Since its founding in 2005, Box has raised over $US564 million and is now valued at roughly $US2.4 billion. 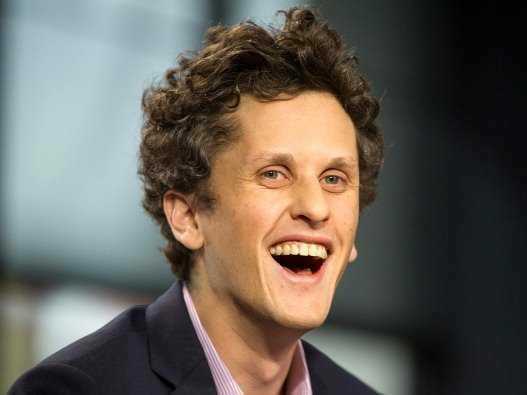 Box’s 29-year old CEO Aaron Levie has been the driving force behind its success. His idea to turn ordinary file sharing software into a business collaboration platform has made Box an enterprise solution that companies and their employees generally love. Currently, 99% of the Fortune 500 companies use Box in one way or another, with over 20 million users worldwide. But when Box filed for an IPO back in March, its S-1 raised a lot of eyebrows because of Box’s high spending rate and massive losses — the company’s sales and marketing expenses outweighed its revenue. Box has delayed its IPO until possibly early next year, opting to raise additional capital from the private market in July instead. Business Insider: Do you have any regrets over the timing of your S-1 filing? Would you have filed a little later? Aaron Levie: We probably would have changed a couple different variables on some of the timing. We ended up filing literally a week before a fairly significant market correction. If you had known that were coming, I think by definition you wouldn’t file. But beyond that, what’s funny is that people forget that to get to this point, we’ve been building the company for nearly 10 years. This is a very small bit of turbulence relative to all of the complexity you deal with building a company. It’s a fairly incremental thing that you work through. BI: But if you keep delaying the IPO, doesn’t it usually mean there’s financial distress or a drop in investor interest? AL: There’s no question that our process has been extremely unusual. I agree with that. But when you kind of look at the numbers and the growth and all of the things that we’re executing as a business, we think that reflects a very different kind of picture from what you might otherwise be perceiving. BI: Then what should we pay more attention to? AL: Across every industry, every size of business, we’re only seeing an increase in the adoption of our platform. It you look at all the customers that we’re now working with: in healthcare, Stanford Healthcare, MD Anderson; in the media, Dreamworks, Disney, and Fox; in retail, Barneys, Gap, and Nieman Marcus. So in every major industry, we’re seeing pretty significant traction with some of the world’s best and leading brands. And we’re also working with General Electric, Toyota, and Eli Lilly. BI: In a recent interview, you mentioned Wall Street is still trying to figure out how to value SaaS companies. What exactly did you mean by it? AL: The biggest difference is merely the fact that in the SaaS business, you get recurring revenue from your customer. So you might spend one thing to acquire a customer and get a certain amount of revenue the first year. But the general idea is you could continue to get revenue from that customer over time. And so in the most aggressive investment periods of your growth, it might look like you’re spending more to acquire the customer than you’re getting from them, but that’s simply because you’re looking at only in the snapshot of the year you acquired the customer. The whole power of this subscription revenue model is that you have a lifetime value of a customer that is very different than the initial annual revenue from the customer and the cost to acquire that customer. So for us, for instance, we have an 80% gross margin and it just happens to be that we spend on sales and marketing upfront to acquire the customer who ultimately becomes profitable on a per customer basis after the year that we acquire them. BI: But there have been successful SaaS IPOs, like Salesforce and Workday, and Wall Street should be used to SaaS business models by now. Why do you think there’s still this “misunderstanding”? AL: I think there’s a significant part of Wall Street that fully understands it. You’re broadly characterising Wall Street as misunderstanding this. The nature of my comment was really just that these models are still evolving, and every business has a unique investment methodology and unique investment threshold. When Salesforce took over the CRM market, there were basically one or two incumbents, and those incumbents were not the largest companies in the technology industry. The incumbent to Salesforce was this company called Siebel. And so, the scale of competing with an incumbent when your incumbent is still only a mid-size company, it requires a different kind of level of investment to compete with them. In our business, our incumbents are IBM, EMC, Microsoft, and so the scale of the competition is far greater, which means we have to have a significant level of investment in our product or technology or sales and marketing to be able to actually go out into the market, and build a viable product and company that customers like GE, Eli Lilly, or Toyota would be able to work with. So in our case, our investing pattern happens to be a little different upfront, but the benefit is that the scale of the opportunity is fairly enormous. We are going after a market where tens of billions of dollars are spent every single year in the legacy technology, and we’re trying to transform that by moving that to the cloud. AL: It’s all on a relative basis. So we will continue to spend and you’ll see growth in all of our investments. But the key distinction is that “relative to our revenue scale” it was at the highest last year. BI: So that doesn’t mean you have plans to cut spending? AL: We haven’t cut any spending. No company who’s really shooting for a very large mission will likely be cutting spending on a broad sense. You’re always kind of reallocating your spend, so the things that Google spends on this year is very different from an allocation standpoint than what Google spent on 10 years ago. Same with Salesforce or Workday or any of these companies. So you probably won’t see a point where we’re done investing, it’s just relative to the scale of our revenue, you will see more revenue now over time grow faster than the growth of our spending. BI: There was a huge debate on startups burning too much cash recently. What’s your take on that? AL: I think that’s something incredibly context specific. So it’s almost literally impossible to generalize a concept of how much money should a startup spend to grow its business. All you could do is generalize the principle and the principle should be, if you have a large market, with a very viable product, and a viable go-to-market strategy, and there are ways of increasing your market share and generating long term profits from customers, you should find ways of investing and growing your business. And some companies who have high burn rates fit in to that category. There are companies that are going after $US50 billion, $US100 billion, $US500 billion markets, and they’re investing aggressively to make sure they win in those markets. And unfortunately what tends to happen in the Valley is as soon as you have a lot of those, you occasionally will have investors become a little bit sloppy and entrepreneurs get a little bit sloppy where if they’re not in that situation they might do similar investments, but their criteria and parameters might not be the same. So they might not have a large market, they might not have a viable product and in those cases, you absolutely don’t want to overspend. You don’t want to over-burn. You ultimately need to find and make sure you have a viable business model and a viable product. So you can’t generalize the advice to the entrepreneur except for find which category you’re in, and what is the kind of moment and time you’re in, and then make the investment decision and determination based on the availability and potential of your company in your market. BI: What’s your plan on growing your paid customer base? AL: It’s our job to continue to add more and more value on top of our platform. I read that Business Insider article last week about this idea of “race to zero” and “race to bottom.” I would actually say the reverse is ultimately how we think of our business, which is, we see ourselves really in a “race to the top.” And what we mean by that is, we are in a race to constantly adding more and more value on top of storage, on top of computing, to deliver more capabilities, more kind of industry-unique experiences, greater depth of our platform functionality to the industries that we’re going after. So it’s all about going into the top 8 to 10 industries and finding where are companies reimagining their business, where are they going digital, where are they transforming their business model, and how does Box act as a platform that could accelerate that push into the future. BI: Can you give us some examples? AL: We bought a company a month ago called MedXT. And they do medical images in the cloud. That’s an example of continuing to add value far above just the kind of storage and compute layer of our architecture and infrastructure. It’s really about changing how do customers use their data and how can they transform their business with their content and their information. Another example is Stanford Healthcare. They are literally transforming their hospital. The healthcare industry is going from a world where you paid only for the service that was rendered at the point of a transaction. You fast forward to today, we have mobile devices, wearables, new sensors, and products like Uber, which have changed the way we think about interacting with the real world. All of these things impact the way we think about the healthcare industry. And so a healthcare institution like Stanford has to dramatically transform the way that they’re going to deliver healthcare to their customers and their patients. To do that, they need to have telemedicine, they need on-demand medical experiences, they need the ability to reach out to patients when they’re not in their hospital. So all of that is going to be enabled by IT, content management and collaboration, and by these new user experiences around data – and Box is the backbone for a number of those experiences. We’re not going to be the only technology vendor that helps them transform, but we’ll be one of the platforms that dramatically changes how they’re delivering healthcare to their patients. BI: So you knew from the early years that the storage component was not going to be the main differentiator. AL: It’s a requirement that we do storage really, really well because we have to keep your data really safe and protected. So storage is really important. But the thing that we knew was the cost of storage was going to decline rapidly so you would have to differentiate somewhere other than just being able to store other people’s data. So that was what we knew ultimately would matter the most. And so starting from about 8 years ago, the value proposition was far more about what can you do with your information, rather than can you merely store it. BI: But it seems like a lot of people still just think of Box as a storage business. AL: I mean, why do people forget every time Twitter does an earnings report that they have a billion people retweeting anywhere on the internet, and it’s an incredibly important platform for the future of communication? People forget things. But we don’t think it’s everybody’s job to understand how our platform works. We think it’s our responsibility to deliver incredible value to our customers, but if people confuse us with being in the storage business or whatever, that’s a cost of just the fact that there are just so many companies out there, there’s so much going on on the internet. If you come to one of our presentations, you would absolutely leave fully understanding our strategy. BI: You’ve always said you’ve dreamed of running a big company. What’s it like in reality? AL: We’re still a startup. In the startup phase of my dreams, this is roughly what I’ve imagined. So you get to deal with just a tremendous amount of just things being thrown at you every single day. The most thrilling part of being at a startup in the industry at the time we’re in right now is how fast things change, but yet, how much you get to participate in that change. There’s a new device you can go build for, there’s a new technology that you can go leverage, there’s a new open source project that you can pull under your technology stack. Just the amount of ways that you can take advantage of how much change is going on is unprecedented in the history of technology and certainly in the history of the world. BI: Even with having your ownership stake down to roughly 4%? AL: That’s less ideal. But it’s necessary. The way we’ve invested in the company and the way that we had to grow our business. We’ve raised over $US500 million in capital and I think that that is an investment decision we’ve made explicitly because we wanted to build the leading transformational company in this category. And we didn’t see any other way that we could make those kinds of investments and get to that kind of scale without that level of capital in the business. BI: Do you talk to Mark Cuban at all? He said he would combust if he had to deal with your level of spending. AL: I think combust out of happiness (laughs). We do email each other occasionally, but we don’t kind of go golfing or anything like that. Let me just clear one thing up. Mark has always been helpful and been close to the company in some way, or at least available to the company. And I have complete respect for him, we have a difference of opinion about how we’ve invested, and how we grow, but he is entirely entitled to that opinion and we remain pretty strong acquaintances and previous partners.